International Journal of Research in Health Sciences,2014,2,2,715-719. 1,3Assistant Professor, 2Professor and Head, Department of Anatomy, Himalayan Institute of Medical Sciences, Dehradun, Uttarakhand, INDIA. Background: Determination of the foetal age at the time of death is one of the major concerns of the department of forensic medicine. In complicated cases like mutilated specimens, where only a few fetal remains are available, forensic specialists might face difficulties in age estimation. Due to its favourable position and superficial location, the thymus can be used for fetal age estimation. Objectives: To find out the mean transverse diameters of the right and left lobes of the fetal thymus in different gestational age groups and establish a correlation of these diameters with the gestational age. 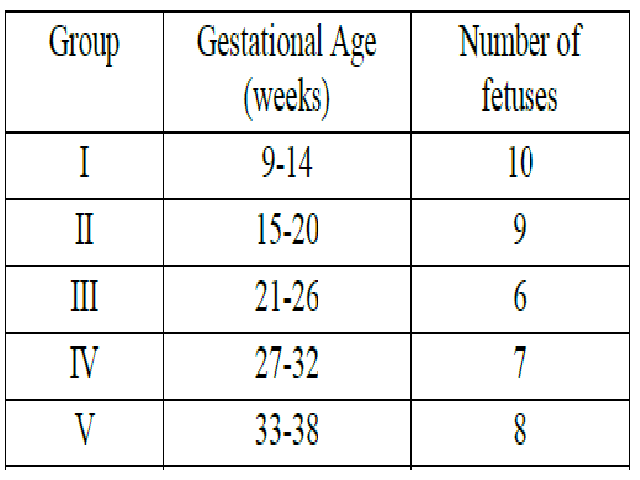 Materials and methods: 40 human formalin fixed fetuses of gestational age ranging from 9th to 38th weeks were used. The fetal thymuses were dissected out and transverse diameters of the right and left lobes were measured. Mean transverse diameters were calculated and correlation was made between the transverse diameter of each lobe and the gestational age. Results: The transverse diameters of the right and left lobes increased with an increase in the gestational age. A positive correlation was found between the transverse diameters of the two lobes and gestational age. Conclusion: The findings may help in rough estimation of the fetal gestational age at the time of death especially in mutilated specimens where only few fetal remains are available.